Three years ago I toed the start line of the Philadelphia Rock ‘n’ Roll Half Marathon. As my first ever half marathon it was always going to be an automatic PR, but I actually surprised myself by finishing in 1:37-something. I also fell hook, line and sinker for racing, so it only seemed right to return to Philly this year in search of another PR. 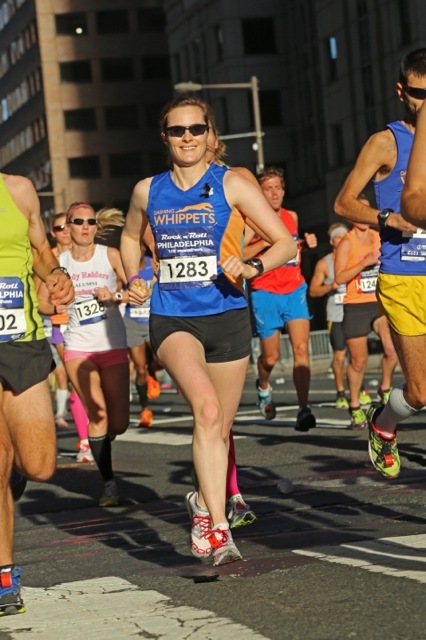 The 2013 edition of the race was my goal for this fall season, and I trained over the summer using a program from Luke Humphries at Hansons, with plenty of guidance and encouragement from Scott, Simon and many other Whippets along the way. Topping out at around 50 miles a week, the mileage wasn’t as high as I’ve done for my previous two marathons, but what I lacked in mileage I made up for with intensity. On many a Tuesday and Thursday evening I’d return home absolutely shattered. But it was working. I was hitting my goal pace and building my confidence en route. However, while my overall training had gone well, the last couple of weeks before the race were insanely busy at work. Late nights and high stress do not equal ideal taper conditions. 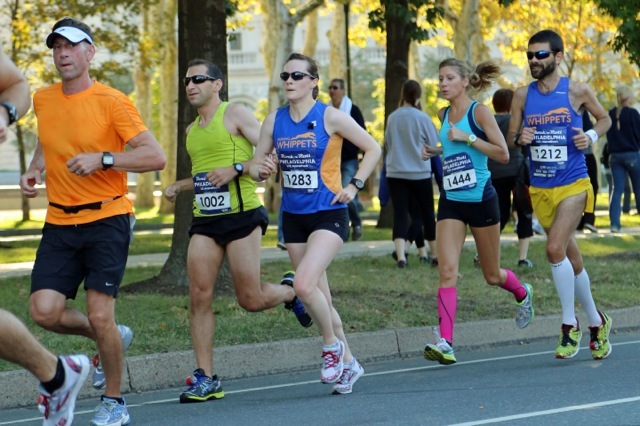 So when we arrived in Philly on Saturday I didn’t feel ready to race or ‘in the zone’ at all. But I also hadn’t had a chance to freak out either, so on race morning I was feeling pretty relaxed. During my shake-out run on Saturday afternoon I had run over to the start line from our hotel and noted it would be a perfect warm-up distance for Sunday morning. What had been a quiet area on Saturday, as the race crew prepped the starting stage and corrals, was transformed on race morning into a hive of pre-race anxiety, pent-up energy, and of course the requisite dose of Van Halen blaring from the start-line speakers. Greg had offered to pace me and I met up with him, Matt, Simon and several others in the starting corral. Shaking legs nervously and joking to distract ourselves from the pre-race nerves, we talked through the race plan. First couple of miles relaxed, around 6:40, and then settle into goal pace: 6:35. I had three objectives for the race: 1) start at a reasonable pace rather than bombing out of the blocks and then crashing later on; 2) stay steady in the third quarter of the race, when I have a tendency to sag a bit; and 3) run sub-1:27. The starting horn sounded and we set off in the beautiful September sunshine. Thanks to Simon’s banter we kept to a nice relaxed pace for the first couple of miles, and all the photos from those early miles prove that we were having a ton of fun. The atmosphere was great, with Whippet support all along the course: Atsede standing on top of a newspaper box taking photos, Mike snapping away at City Hall, and Michelle seemingly at every street corner! Once we had done the loop of the city and headed out along the river, around mile 4-5 I think, it got quieter and the crowds thinned out. This was where I was really glad to have Greg keeping me focused on the pace. We had hit a good rhythmn and ticked off the miles exactly on pace, running under the many bridges until we got to the turnaround bridge just before mile 9. This was a tough moment for me, with a tiny bit of a ‘hill’ in the course as we went over the bridge. I fumbled for my Gu chomps and slowed just enough to break my rhythmn. As we headed into the business end of the race, I knew I had to regain my focus. Greg stayed on my right hand side, giving me words of encouragement as the pace started to take its toll. Up until about mile 10 we had been keeping it pretty steady around 6:35 as planned. But the first few miles had been perhaps a tad too relaxed and Greg was telling me we needed to pick things up a little to stay on target. I was able to rally for the next couple of miles, spurred on by all those tempo runs and the same lone drummer who had been in the same spot on the course, just after mile 10, three years earlier. When we got to the 12 mile marker though, I was faltering and had to dig deep. While I wasn’t able to keep the sub-6:30 pace I’d managed to crank out for the previous couple of miles, I gave it all I had and chased Greg for the final yards before the finish line. That feeling you get when you cross the line never gets old – a heady mix of exhaustion, elation, and a glowing sense of achievement. Actually the glow is probably more to do with the sweat, but I think you know what I mean. I managed to sneak in sub-1:27 and truly feel that I ran the best race I could on the day. With thanks to Greg, I executed my race plan and ran a negative split for the first time in a race longer than 10K. What’s more, I really enjoyed the race and running with a great group of Whippets and Whippety friends for so much of the course. All in all, I had a great day running in the City of Brotherly Love, and I’m looking forward to building on all the things I’ve learned from this training and racing cycle for the next race. Onwards and upwards!